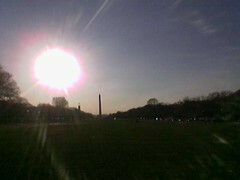 It was nice enough out for a walk down to SW DC this afternoon, and I took these snaps as I went along. (I decided to let them gather in my Flickr photostream rather than post them to here one by one, just to keep from flooding my weblog with single mobile updates.) 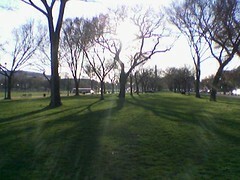 Upper left: sunlight streaming through the trees onto the green grass of the National Mall between 3rd and 4th St. Upper right: Washington Monument and bright descending sun. 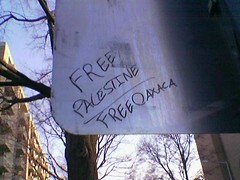 Lower left: Graffiti on a sign, calling to free Palestine and Oaxaca. 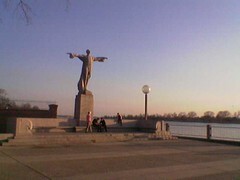 Lower right: Titanic Memorial, Southwest Waterfront. You should add “Reunite Gondwanaland” next time you’re there.